Bysterstorff's Beam me up Schröder went again today to ultrasound. The current report is available at Schröder's page under the progress reports. Nevio was again for routine checking at Dr. Kirsch. The short report can be found on Nevio's page under the progress reports. On monday we randomly found out that our item 'Tricuspid valve dysplasia - What's that?' is saved as PDF source on the homepage of the Foundation for Scientific Research Dogs e.V. for the disease tricuspid valve dysplasia. That makes us a little proud and we are obviously very pleased that the subject spread increasingly. The first Chairman of the Foundation for Scientific Research Dogs e.V. has now promised to me to link our homepage and to publish the call for blood sample submission in the next newsletter and on the website. We're so happy!!! Lately the impression may have arisen, that it has become a bit quiet to our initiative to tricuspid valve dysplasia. Unfortunately, there was little new information to be made public and also our list of affected dogs stagnated for a few weeks. However, we are working behind the scenes without a break. In the last few weeks and months we were in close contact with breeders and / or owners of affected dogs on the publication or non-publication of those all the time, as well as with decision makers from LCD e.V. regarding missing or incorrect entries in the database and understanding problems regarding the official results sheet of the Collegium Cardiologicum e.V. To at least solve the understanding problems as soon as possible, we have submit in mid-June, in response to the June issue of the LCD CZ (Issue 129) – as reported before – a statement on the structure of the CC-finding sheet with the request for publication in the club newspaper of the LCD e.V. Unfortunately, this request has not been complied yet. We still hope of a publication in the next issue. However, in the August issue of the club magazine of the LCD e.V. (issue 130) on page 17 was published another article about heart disease in Labrador Retrievers, especially tricuspid valve dysplasia. First of all we would like to say that it is of course great that such an important issue for us now also comes increasingly officially to the public (at least as public as an internal club newsletter can be). And we have at least a small consolation in respect to our previous request of publication that is also acknowledged by officials, how little the official CC-sheet of the tricuspid valve dysplasia does justice. Also, we are grateful that now the exact procedure at request for registration of emerging diseases in the database of the club desired from LCD e.V. was explained, because in this respect there were constant disagreements. That the text refers once again to few diagnosed TD-cases by cardiologists so far, makes us getting a little tired. On the one hand the question is how the word 'little' is defined (at least the issue is not minimized by the cardiologist we know). On the other hand, we have already pointed out quite often that even a high degree of TVD does not necessarily go along with clear symptoms and therefore (in the absence of an autopsy even after potentially premature death) can remain undetected. If you want to make a credible statement, there is hardly anything else left but to collect the data required in the form of the first phase of the phase model of the VDH to combat hereditary diseases and defects. In our opinion not only the Labrador Retriever that will be admitted in the next 3 years for breeding, but also as many of the already approved breeding dogs (and their descendants, in the best case) need to undergo a cardiac ultrasound. On the one hand it's already proven that there are dogs in breeding, which have offsprings coming down with TD and on the other hand a larger sample promises of course a more accurate approximation to the true number of diseased dogs - apart from the fact that this first phase initially permit only an estimate regarding the phenotypic occurrences, but not regarding the potential genotypic predisposition. But a good start would be made obviously. Furthermore, in the statement is explained that no phenotypic abnormalities were found during inspections by the parents of the few known TD-affected dogs and therefore (!) it's not possible to prevent any further cases of the disease by cardiac ultrasound examinations of every possible breed dog. The fact that the LCD e.V. has been always talking of only 2 (or now maybe 3?) official cases and the parents are now used for these conclusions in respect of all breeding dogs, is in our opinion more than ridiculous. Certainly – on which the LCD e.V. bases in the current text, and we hope this is also seen by every breeder the same – it won't be bred (further) with at least one health showy dog and will be not examined as part of a breeding program. However, we would be here again at the point that not every TD-affected dog also (directly) is health conspicuous. A breeding license can be requested from the LCD e.V. already at 15 months. We dare to doubt that any of the known TD-cases, if at all, was striking health at this age. Whether and how many potentially affected dogs have so far received a breeding license, is completely unclear. Occasionally it happens that even breeding dogs die unexpectedly and not always an autopsy takes place in this context. Of course, a potential connection to the TD at this point is an absolute speculation on our part, but to exclude it per se, we consider as much more dangerous. First of all, we are delighted that the LCD e.V. asks for the help of concerned owners and breeders regarding the clarification of the frequency of heart disease in Labrador Retrievers. And we also find it quite remarkable with what confidence this issue is considered from the LCD e.V., because they seem to be to be quite sure that with the help of breeders, informed LCD Members and the CC-cardiologists it should also succeed to clarify the question of the frequency of occurrence of heart disease in Labrador Retriever without a breeding program needed. We would be more than happy if the LCD e.V. is right in this point. However, we wonder then why our since more than 2 years existing active work on tricuspid valve dysplasia is apparently not understood as help and both we and some breeders are prevent to do our awareness training. While reading the statement that with the aimed storage of blood samples of affected dogs with access for the breed association could be also a research support, we were shocked. Apart from the fact that we knew in any way so far that the LCD e.V. is seeking the storage of blood samples of affected dogs, we must probably honestly ask at this point whether all the info messages in recent months have disappeared in the LCD e.V. spam folder. Because otherwise we can not explain this statement. The LCD e.V. should long know that we have already started with the collection and storage of blood samples of affected dogs and also a research project in collaboration with the TiHo Hannover was already off the ground. About all these steps, we have informed the LCD e.V.. We have posted our digital information flyer with request to be printed in the CZ – nothing happened. We have posted our call for research project and the storage of blood samples – nothing happened. We would say that we have done in the last 2 years a considerable preparatory work in this area (both theory and practice), and it's even more incomprehensible why this part of the association not even now – where at least the need of theoretical treatises on this topic have been well recognized by the LCD eV – is contemplated to work with us. We must repeat again: We have already started with the storage of blood samples! Our contact details are visible for anyone publicly provided on our homepage. 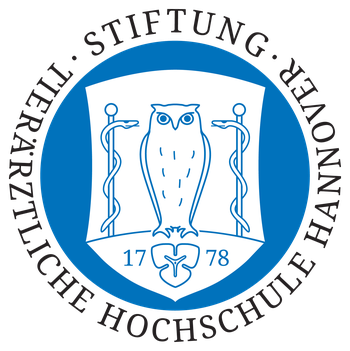 The contact details of Dr. Distl of TiHo Hannover are just as easy to find. What could be more natural than to continue this preliminary work – if one plans serious about this project. However, neither our information were ever printed, yet it has been attempted to contact us regarding the previously stored blood samples to the target of a potential collaboration. Although this subject might seem due to the repeatedly partly very critical reactions on our part to the recent contact to the LCD e.V., but we were and are always ready to put all the potential differences in the sense of cooperation for the cause shelved. Because – and we have repeatedly made clear from the beginning and we do it now again – it is not our interest or our intention to pillory the associations or breeders or to blame them for the TVD. No! We just want to find out what is going on with the tricuspid valve dysplasia in the Labrador Retriever. But somehow we increasingly feel that someone wants to make ourselves a fool. We thought we had now talked about it enough. But then we have to read that for the LCD e.V. only with outwardly healthy looking and fully loadable Labradors will be bred. Ok, so far so good. However, we must note here (and we apologize, because the disc has a crack) that even outwardly healthy looking, fully loadable dog can either phenotypically themselves have a TD or they can at least pass it genotyped. After all, the in the text itself taken as example parents of affected Labradors were phenotypically healthy and indeed in breeding – hence the face validity can hardly be a sufficient criteria. But we have actually explained it several times. Some might now might think that we should still be happy about the fact that the issue was again printed in the CZ. And as we mentioned in the beginning, we do so in general. However, the issue is too important for us as that we could 'only' therefore ignore our opinion on questionable passages. For us, the so far within the association published texts are unfortunately still rather an attempt to give the subject for the critics and skeptics sake attention but without having to deal with it in depth and mainly without dealing with it actively. Dr. Kresken and Dr. Wendt from the Collegium Cardiologicum e.V. have written a foreword respectively an opinion for our website. We are very pleased about this renewed support of the CC and thank wholeheartedly Dr. Kresken and Dr. Wendt for taking the time to write this text for us. Our list of affected dogs did increase again. The owner of Rycroft's Truly Remarquable gave us her permission for publishing Truly. Until now Trulys TVD is the eldest case on our list and herself reaching an age of nearly 15 gives us hop for our heartdogs. We thank Trulys owner for her confidence and support. Since we believe that it is (especially in breeding terms) of great importance to be able to read the CC-examination form properly, we have – in consultation with Dr. med. vet. Kresken – submitted a statement on the structure of the CC-finding sheet with the request to be printed in the club magazine of the LCD. Since we are also dependent on the support of veterinarians, we are pleased today even more about the publication in the June issue of "VET Impulse – Die Zeitung für die Veterinärmedizin”. Working Test, that Gaby Düser organized together with Anna Korte and Arndt Wellbrock last Saturday for us, was a huge success! We have received lots of positive feedback and we are delighted that both humans and animals had a lot of fun. We wish we could have been there too, but we couldn’t make it in ways of time and organisation. 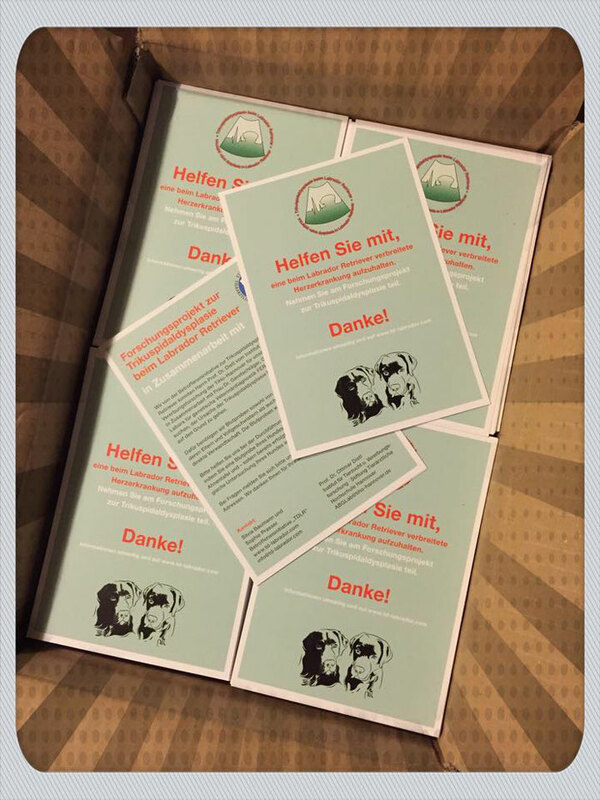 The specially made dog biscuits and thank you cards didn’t find the way to the Sauerland neither because of the post-strike last week. Every participant / judge / helper who still would like to receive a belated little thank you from us, contact us via e-mail. We would be very pleased if at least a couple of biscuits make it to the sweet and hardworking fur noses. We are still deeply touched by this great campaign and thank each and every participant, helper, judge and the organizers and sponsors wholeheartedly! The public newspaper 'Blickpunkt Arnsberg-Sundern' reports on the working test, which takes place next Saturday in favor of our initiative right there, namely in Sundern. We are delighted with this report and wish all participants, helpers, judges and spectators a lot of fun and hopefully great weather! 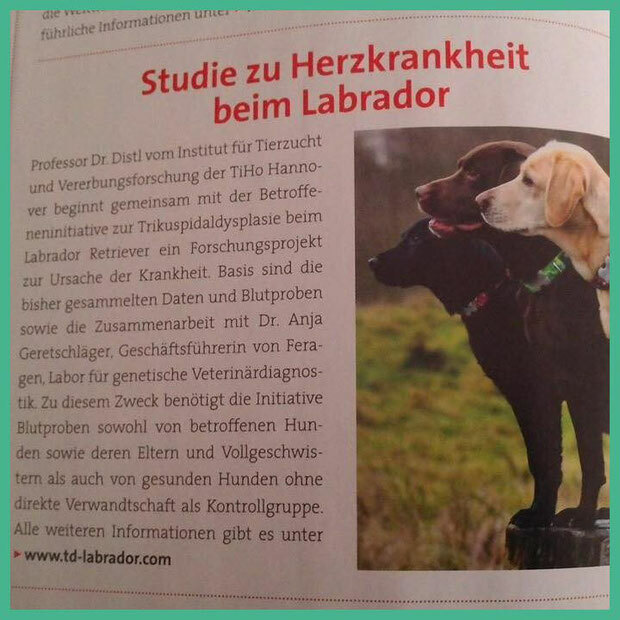 We’ve been discovered in the latest issue of 'Partner Hund' (6/2015). 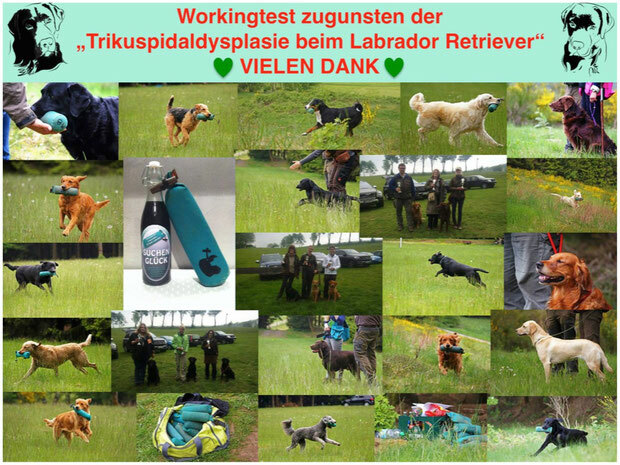 Besides, the starting list for the training working test, which Gaby Düser of 'Villa Hundeträume' has organized together with Anna Korte and Arndt Wellbrock in favour of our initiative, is now online. We are thrilled that so many messages have been received and we wish all the teamsa lot of fun and good luck! 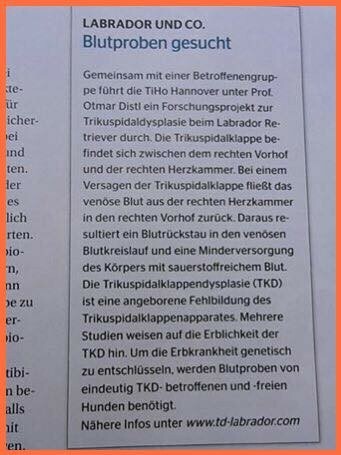 'Der Hund' has already published about us and we are very delighted about it! We have very wonderful news! Gaby Düser from 'Villa Hundeträume' as well as Emmas owner Anna Korte and Arndt Wellbrock host a training working test in favor of our initiative at the 23rd of May. The earned money will be sponsored to us! We wish all the participants of the working test a lot of fun and good luck! We hope to see some great pictures! Again we got the sad news of an newly affected dog. The owner of W-Numerus IV ex Chelsea (Oskar) informed us two days ago they Oskar got diagnosed with a severe TVD. To support us, Oskars owner will send us blood samples for our research project. We thank Oskars owner very much for her support and trust in us and hope that Oskar will live a long symptom-free dog life! You find the list of affected dogs here. Bysterstorff´s Beam me up Schröder went to his 14th ultra sound check. The report can be found, as usual, on his page. Another male-dog needs to be added to our list of affected dogs. The owner of Ashford Castle Babbit (Mr. Löbl) informed us yesterday that they diagnosed a severe TVD at the 17 months old dog. We thank his owner from all our hearts for her trust and support. We really hope that Löbl (as he is called from his owner) will get good medical help so he can happily live many years from now without any pain! Finally I found the time to write down my thoughts about Schröder (Bysterstorff´s Beam me up Schröder). You find the text on Schröders page. Emmas (Krissy of Daydreams Delight) owner sent us a short update. You can find it on Emmas page. Ta da! Our flyer about the research project are finally there! We try to spread those as widely as possible, at vet offices and clinics. It would be very nice if you could support us with that! Everyone who likes to help simply need to send us his/her address, plus the number of flyers one likes via Email. We thank you very much for your help! Our beloved Nevio was again at Dr. Kirsch for a controle. You can find the update about his health condition under the field reports, Nevios page. We really hope that the blood test in four weeks will bring an all-clear. Nev, Schröder sends you a load of brother-love! We are and stay positive. Emmas owner sent us a sound record with Emma suffering from breathlessness due to a thorax effusion. She asked us to publish the record here. You can find it under the field reports at Emmas page. Again we had to add another dog to the list of affected dogs. The owner of Yes we can Charming Princess Keena wrote us a long mail over the weekend and reported about Keena. She also ensured her full support for our work, that we are very happy about! She will send us a field report about her life with Keena very soon. I am truly sorry that Keena and her owner now have to learn to live with TVD. We are very proud to announce that we enthused and won Prof. Dr. Distl, from the Institute of Animal Breeding and Genetics of the University of Veterinary Medicine Hannover, foundation, for our study. Prof. Dr. Distl will support us now with the research work we started with Dr. Anja Geretschläger from FERAGEN. You can find all the information to the project on the webpage of the institution: here. We need blood samples from infected dogs for this research project, as well as from their parents and full siblings. We also need blood samples from healthy dogs without any kinship to a diseased dog as a control group. The blood samples will be handled anonymous, so there will be no records about the dog owner whatsoever. Our new request for blood samples can be seen in German (here) and English (here). We would be very enlighten if you would help and support us by getting a blood sample taken and sending it to Prof. Dr. Distl. For further information write us or Prof. Dr. Distl via Email. The owner of Kimi (Kimi of Daydreams Delight) sent us a very emotional field report today. We like to thank Kimis owner wholeheartedly, that she found the strength to write about Kimi after such a long time. You can reach the report with a picture here. The owner of Emma (Krissy of Daydreams Delight) sent us a very moving field report for our homepage. We like to thank her very much. We know in person how hard it is to write about the doom of our heartdogs. You find the report and a picture of Emma here. Emmas (Krissy of Daydreams Delight) owner informed us that she is finally at home. She is very excited and can´t keep still. In the car, on her way home, she was allowed for once to sit in the front (perfectly secured) – the joy was just too great for both of them! Emma and her owner are more than happy to be united again! Emma (Krissy of Daydreams Delight) is finally allowed to go home tomorrow! The cardiologist could find some supra ventricular extra systoles (arrhythmia/irregular heartbeat, visible as an extra heartbeat above one of the ventricle. Those are not rare for Emma due to the TVD caused increased right vestibule. But they cause an even worse blood flow, so the blood is blocked additionally to the TVD caused tricuspid regurgitation. Emma gets medicine against the symptoms of TVD plus small doses of Diltiazem (60mg) against the arrhythmia. The cardiologist assumes that this should be enough to cause no further water retention. Should this happen anyway, there is still the method of the 'Rashkid- Maneuver', to minimize the pressure in the right vestibule. 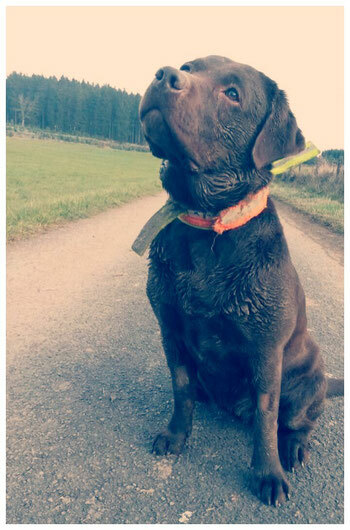 We cross all our fingers, toes and paws that the medicine works and she can enjoy her life without any pain and jump through many more muddy puddles! Emma (Krissy of Daydreams Delight) did not get the heart operation using the 'Rashkid- Maneuver' as it was planned first. Until this morning the operation was still scheduled and Emma was again carefully examined with an one-and-a half hour ultrasound. Here, the cardiologists could not find any new congestions in the vessels and there were normal pressures everywhere. Since this is untypical for the breakdown of the right side of the heart, the doctors did some more test – ECG and some endurance tests. The latter were absolutely unobtrusive, and the ECG showed arrhythmia. So the doctors assumed that there are more causes for the water retention and changed compression rates at times. Since Emma is stabile and the operation needs a 100% certainty that there are no other reasons for typical TVD symptoms, they decided to postpone the operation. Prior, the doctors like to check Emma with a long-term ECG and eliminate the possibility of impaired outflow in the lymph. We will inform about the progress. Emmas (Krissy of Daydreams Delight) owner just informed us that Emma gets an operation tomorrow. Emma did not show any symptoms until last August and did not need any medicaments. Unfortunately, her condition got worse rapidly. She got lethargic and had a hard time to breathe. Emmas owner could not feel any water retentions though. Due to this rapidly worsening condition, Emmas owner drove her to the animal hospital in Gießen, where Emma was checked extensively. TVD was diagnosed and sadly 1,5l of water in the thorax, between lung and heart, were found as well. This squeezed the lung and thus Emma could not breathe as easily as usual. The water was absorbed properly; Emma was regulated with medication and stayed for observation some days in the clinic. In the following time, Emma was jolly and happy and even made the Dummy A, until she worsened around 2 weeks before her planned control meeting in the clinic end of November. Emmas owner went to the Gießen immediately, where they again absorbed around 1,5 liter of water from her thorax. On the basis of her acute and profound bad state there are just two possibilities for Emma: euthanasia or a heart surgery. Emmas owner did not think for long – they want to try everything possible to provide some more happy and symptom-free years for Emma. This is why Emma gets an operation tomorrow afternoon in the clinic in Gießen. The operation is called 'Rashkind maneuver' and is originally from the human medicine for pediatric cardiology but it can also be used within animal cardiology. A hole will be torn into the atrial septum (partition between right and left vestibule) by using a catheter. This hole will then be supported by a stent, so that the blood can flow directly from the right to the left vestibule (some more detailed explanations can be found here). The 'Rashkind maneuve' is definitely not an minor intervention and the time point of the operation must be perfectly adjusted to the current constitution of the dog. The doctors, as well as Emmas owner are very optimistic. Of course, an anesthesia which is gentle to the heart will be used and the observation after the surgery is done under intensive care and with extra oxygen supply. The length of this control-period depends on Emmas recovery and can take up to several weeks. We will think of Emma and her owner and will activate all our thumps, toes and paws to send Emma very much power, positive energy and love for her operation tomorrow! We will write some updates here.